We were driving down the highway and saw this beautiful view. 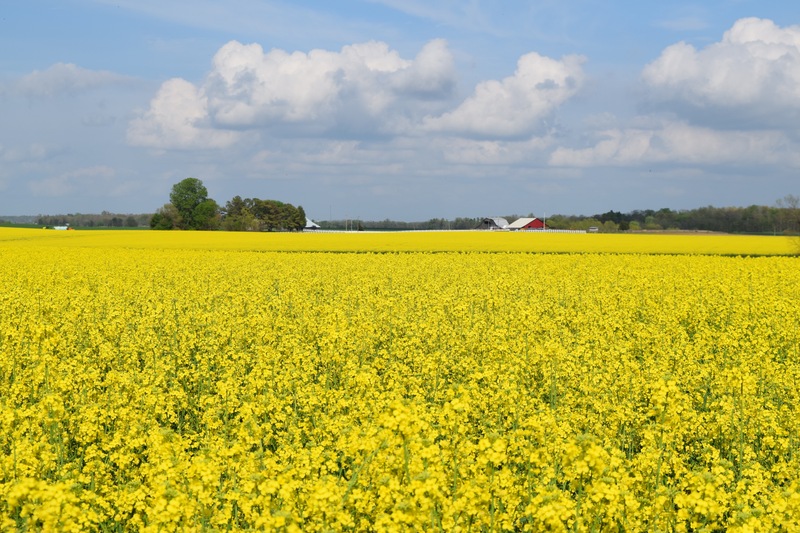 We pulled off the road and Googled “What are the yellow flowers growing in the fields?” Wikipedia knew exactly what we were talking about; its first response was, It’s a field of rapeseed (Brassica napus — in the same plant family as mustard, cabbage, and kale). 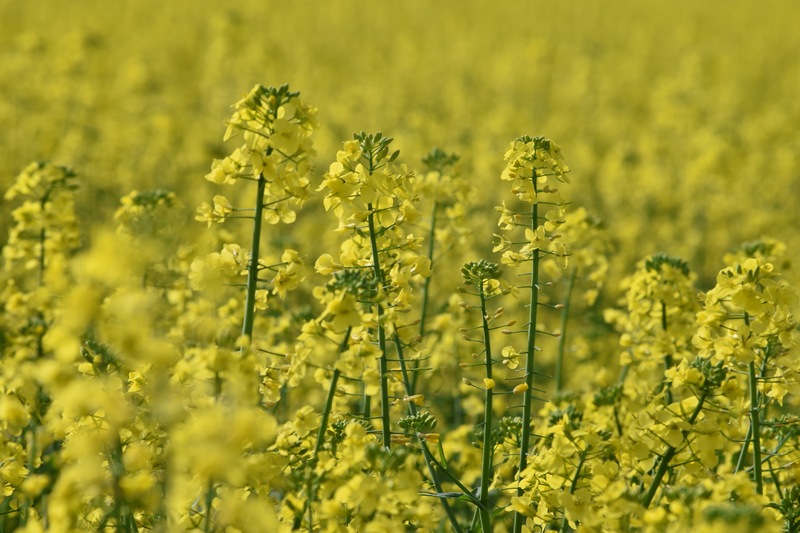 The seeds produced by these plants are crushed to make rapeseed oil. 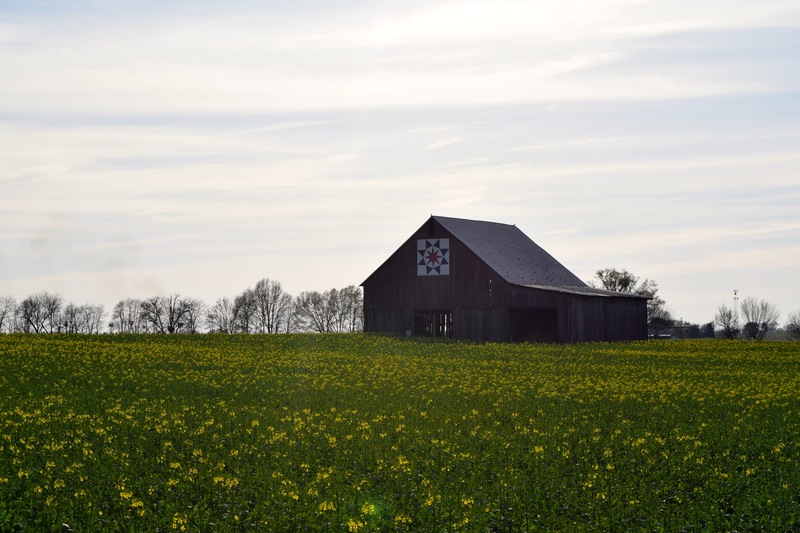 We had seen this yellow field and barn the week before on the road between Hopkinsville and Cadiz, KY and had pulled over to photograph it. We had no idea how yellow it was to become. Here it is a week later. Spectacular as this barn on the side of the highway was, we saw more and bigger yellow fields on the horizon and got back into the car to explore them. 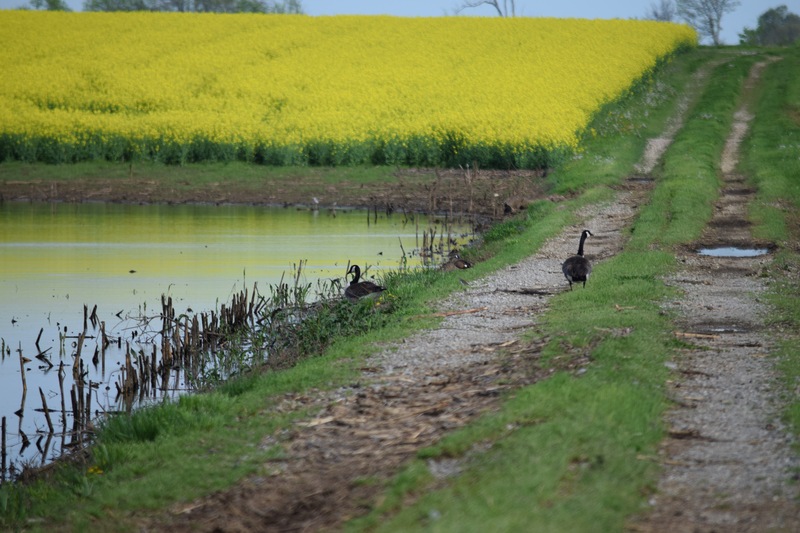 We saw a road with geese strutting across it. He’s curious, too. That’s why I married him. I knew he’d take the road. We drove a little further and what we saw was unbelievable. In our entire lives, we’d never seen a yellow as yellow as this yellow. 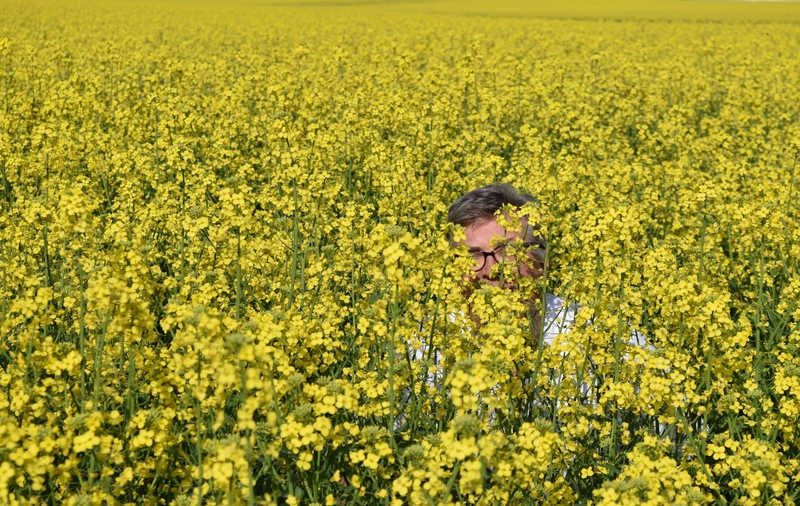 We both jumped out of the car to marvel at the fields and then he did something I would never think to do because I am wise and I always consider the snakes, creepy crawlers, and axe-murderers of the world — he waded into the sea of yellow just to see how tall the plants were. He was kidding, but still. I told him to move out of the way. A sprayer was coming. By now I’ve taken a hundred pictures, but the color and light are tantalizing, and I want more. I can’t help myself; I want to capture it all. So I say, “Just a few more pictures and I’ll be done. I promise.” This field was a photographer’s playground; I could have shot in it all day. 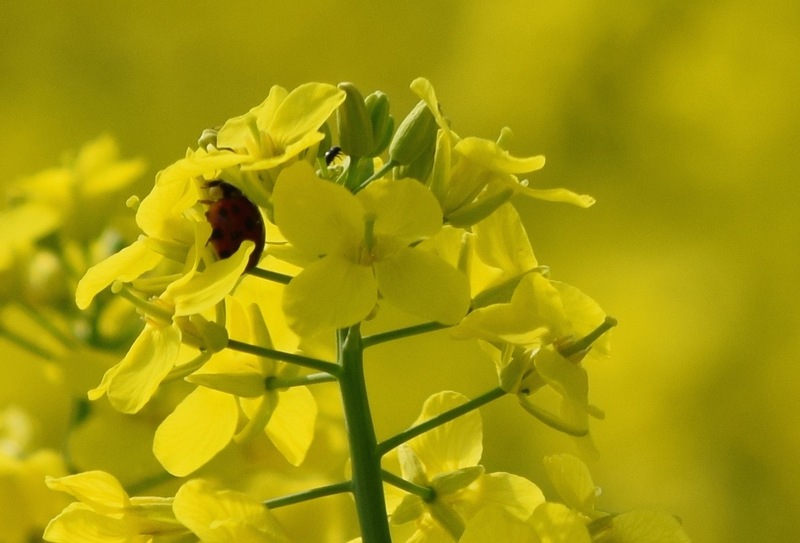 I read a more about rapeseed. 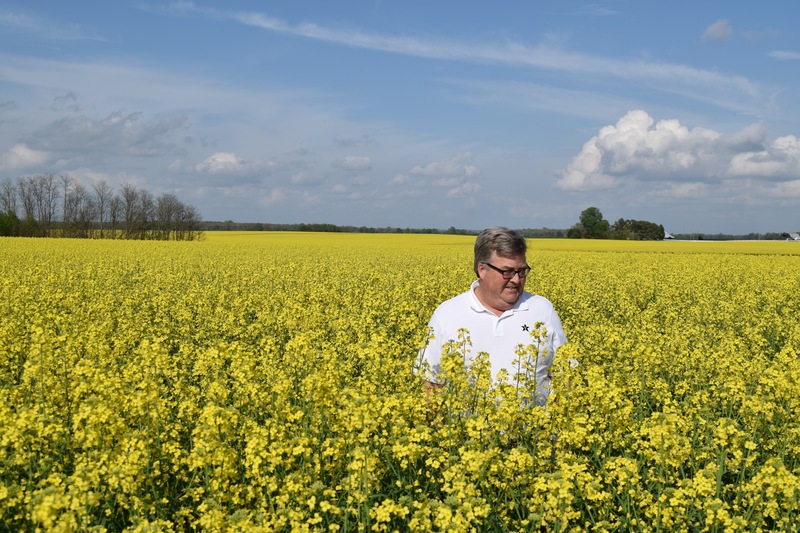 I learned that in the 1970s, a group of Canadian plant breeders sought to develop an edible, nutritious oil that would grow well in the prairies. 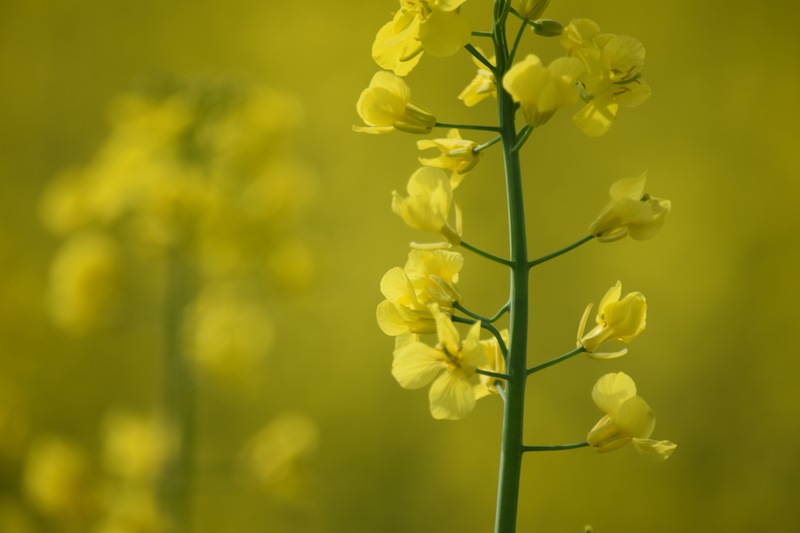 They succeeded — the seeds they developed from the rapeseed plant are 44% oil, more than double the oil content of soybeans, and only 7% saturated fat, the lowest of any vegetable oil. The other 56% of the seed is milled to make a high-protein meal used to feed livestock. The Canadians needed a new, more respectable name for their cultivar. They came up with can-o-l-a, Canada-oil-low-acid. 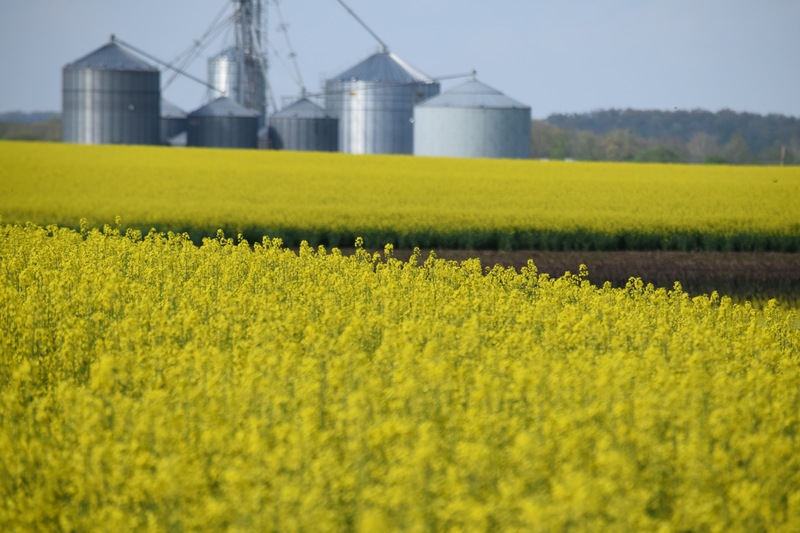 Canola is the most profitable crop grown in Canada, and Canada remains the global center for research on their “Made in Canada” crop. I saw this sign on the side of the road of a canola fields in Cadiz. 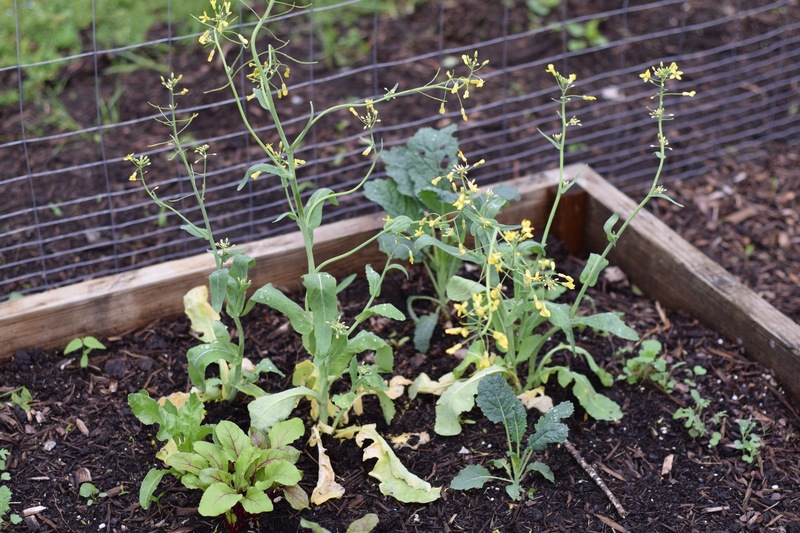 This looks like the flowering heads of kale and broccoli growing in my garden. I like to see how plants grow and seeds form, so I uprooted a few plants from the side of the road (roadsideya, as I call it) and planted them in my garden. 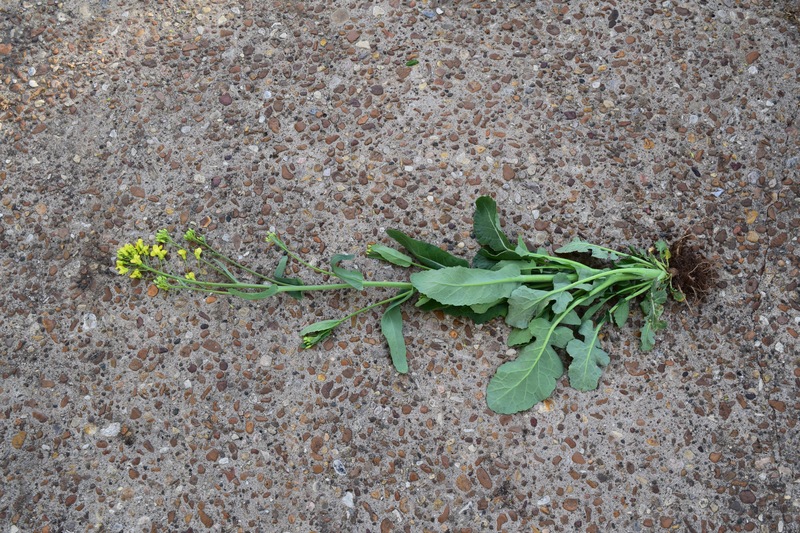 This is a photo of canola seed pods taken on June 12. The seeds start to grow inside the pods once the flowers are pollinated and the blooms drop. 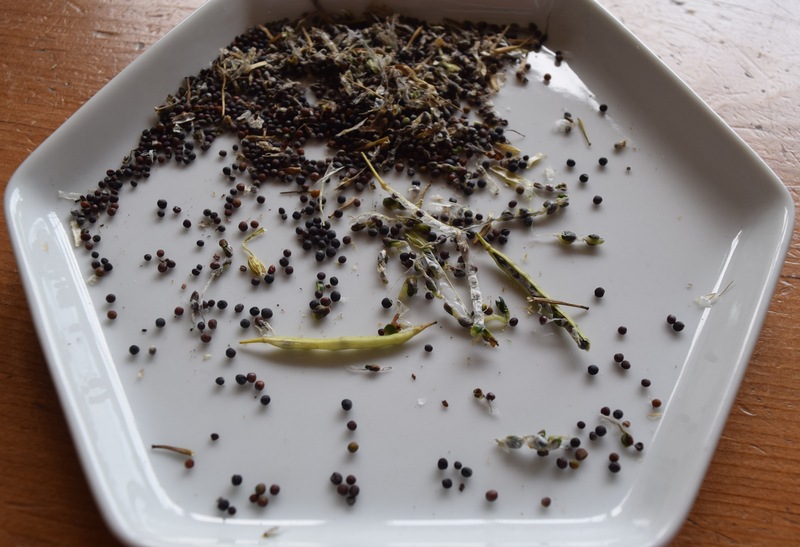 Here are the canola seeds from inside the seed pods I grew in my back yard. 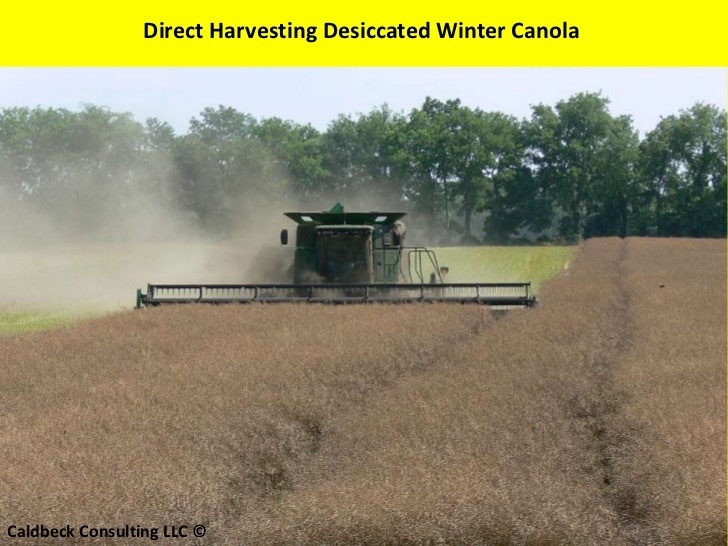 This photo from the Internet shows a combine harvesting desiccated canola. 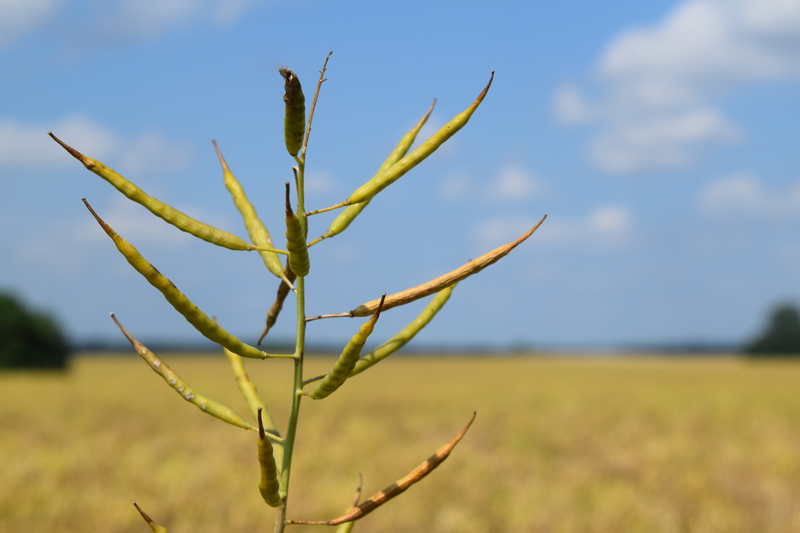 Crop desiccation means to apply an herbicide shortly before harvest to aid in uniform crop dry down. 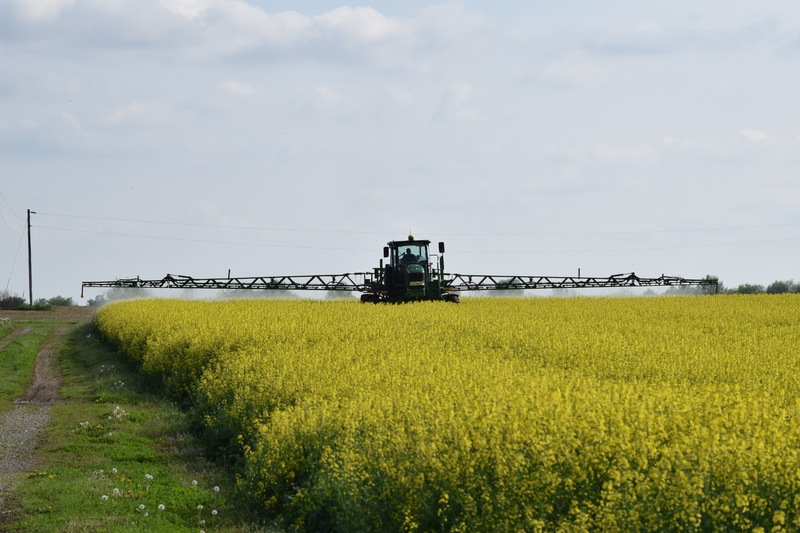 Herbicides reduce the green material on a plant so it won’t clog up the combine when it comes time to harvest the seeds and grains. All of the photos used for this post are untouched (no color enhancements added) except for cropping. In other words, Isn’t the yellow awesome?! This may have eclipsed your sorghum story. Gorgeous!!!!! Thank you, LA! We both love a beautiful field of flowers. LOVE your descriptions! 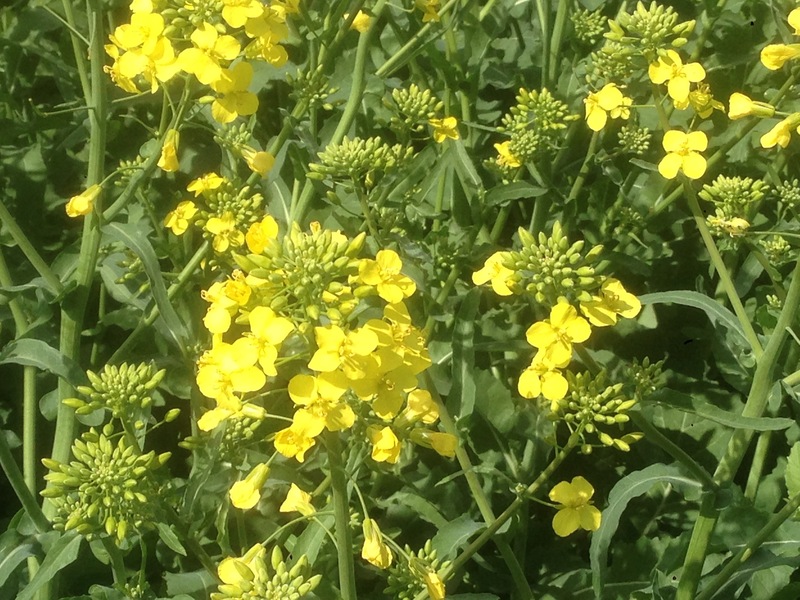 First time I saw rapeseed growing (made intocanola oil, I believe) was in Ireland. Imagine that yellow beside all the shades of green! Thank you, Beth! That must have just been gorgeous. The drive, colors, shots, fun, education…what a delightful day! That’s one of the reasons I love exploring farmlands–there’s so much to learn. Plus, I love watching plants (and children) grow. Thanks, Jutta! You are always so kind! Thanks, Aimee! That Kelly, he’s a fun one. Hahahahahahaha! Gonna grow my own canola for TNFP! Thanks, Kristen! Wasn’t it gorgeous?! I’m not sure why there is so much of it growing in KY. I haven’t seen it in TN. Thanks for writing! Do they sell it as rapeseed oil in the markets there? Your descriptions made me laugh. You sound like me! I love flowers, intense color, and appreciating the natural glory of it all. But unlike me, you are so good at putting it into words. Thank you! Thank you, Treya, so appreciate the compliment. About the natural glory of it all- I agree!